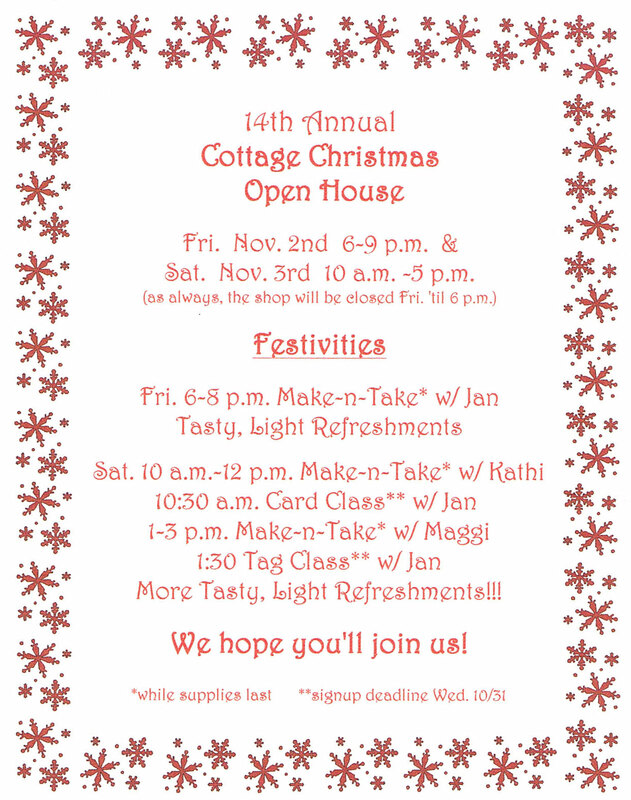 Save the Date: Cottage Christmas Open House! The Cottage welcomed special guest teacher, Louise Healy, to the shop this past weekend (October 19th-20th) for several outstanding classes exploring the amazing possibilities of Dreamweaver products. These technique rich classes were a hit! Participants LOVED Louise's FX molten magic lava cards. If you couldn't attend, the shop hopes to host another class in January or February demonstrating this specific technique. Keep an eye on the calendar! We are starting a new series on the blog with a focus on introducing you to our fabulous teachers. We thought it would be fun to pick their brain about paper crafting, stamping, and life in general! We invite everyone to experience their first class knowledge of crafting, as well as their fabulous personalities, by signing up for a class today! Kathi is married to a wonderful husband who is an "enabler" with regards to her paper crafting addiction! He has cheered her on through all her endeavors with teaching and being a Sales Representative in the industry. He is the love of her life. They have two married children and three wonderful grandchildren. COLOR... All my life I have been inspired by color. My favorite colors are the bright colors of the rainbow! What are some of your "go-to" supplies for crafting? Genesis paper cutter, Scor-Buddy, May Arts ribbon, rubber stamps, Dreamweavers stencils, and ink pads. What is your favorite crafting technique? 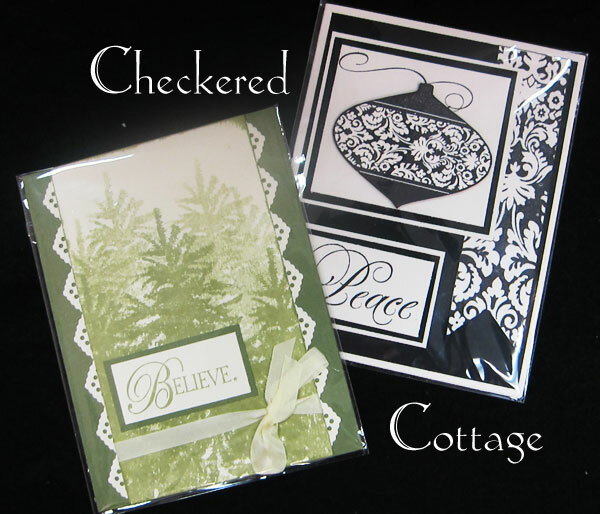 I actually have two favorites... stamping backgrounds and stenciling with embossing paste. Many of my classes will feature paste, embossing, and double glitter techniques. How would you describe your crafting style? I have been told that my style is very classy and elegant. Practically all of my life... my mom showed me how to thread the sewing machine when I was 6 and I have been sewing ever since. I actually sewed rag-dolls when I was in elementary school. 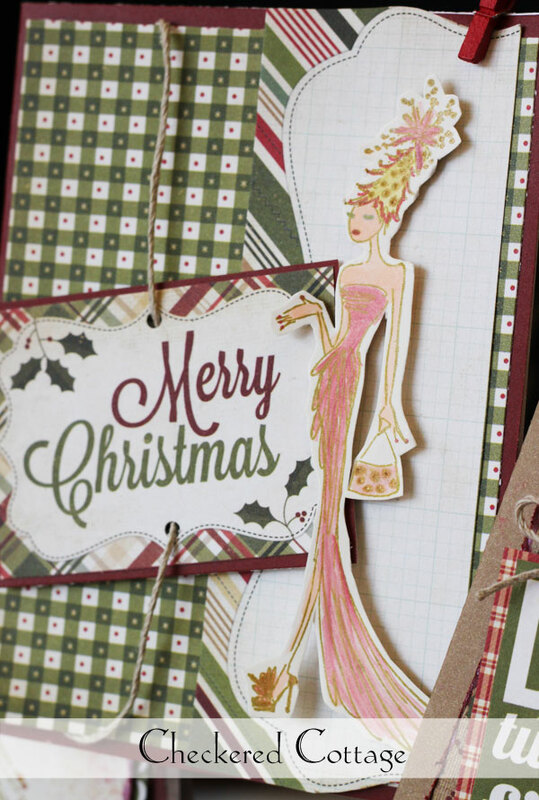 I discovered paper crafting 15 years ago and began teaching classes in a local stamp store very quickly after. I became a sales rep in the industry about 9 years ago. I have been many places but never to Alaska so I think I would like to go to Alaska. What is your favorite snack to munch on while crafting? Suprisingly, I do not munch when I am crafting. Most of my crafting now is done for store and class samples and I would be too afraid that I would spill on one of them and destroy my hard work. I totally love listening to golden oldies from the 60's and 70's. Yes, but I have trouble finding time to pin anything to my boards. 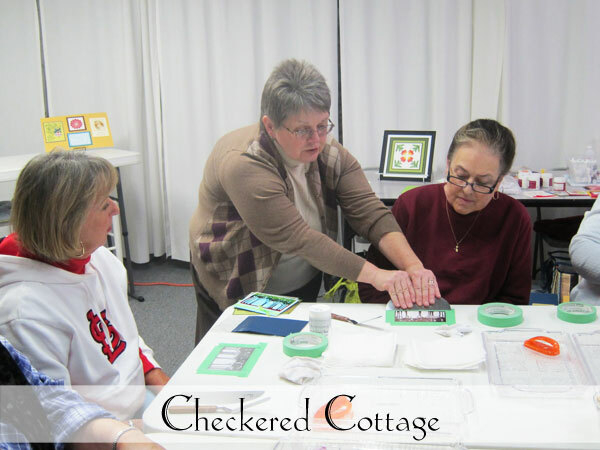 When you aren't teaching classes at Checkered Cottage, how do you spend your time? I have three wonderful grandchildren that I love spending time with. Also, I love to read... right now I am totally into the zombie genre! Go figure! 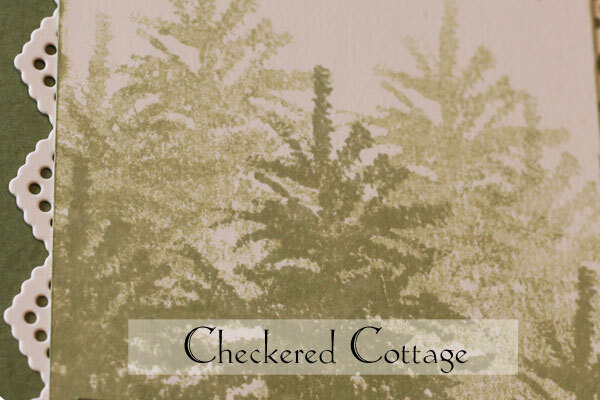 What do you love most about Checkered Cottage? I love the people!!! 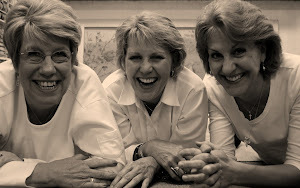 Susan, Robyn, and Linda will do anything to help you find what you need to complete your special project that you are working on. I love that they are always in a great mood when you drop in and that there is lots of laughter! You can tell that they love what they do and that is very important! I love being a small part of the Checkered Cottage teaching staff! 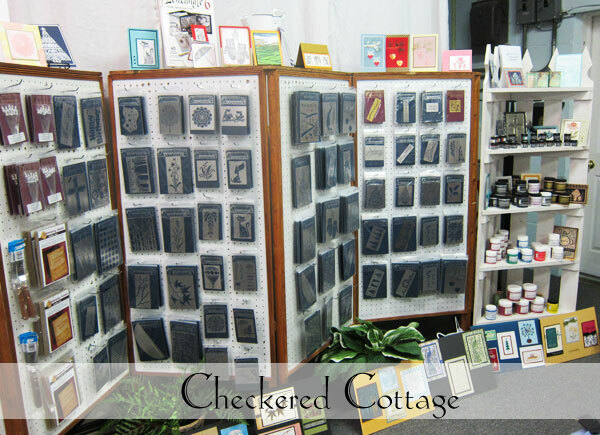 What can you tell us about Checkered Cottage's upcoming Dreamweaver's Trunk Show? 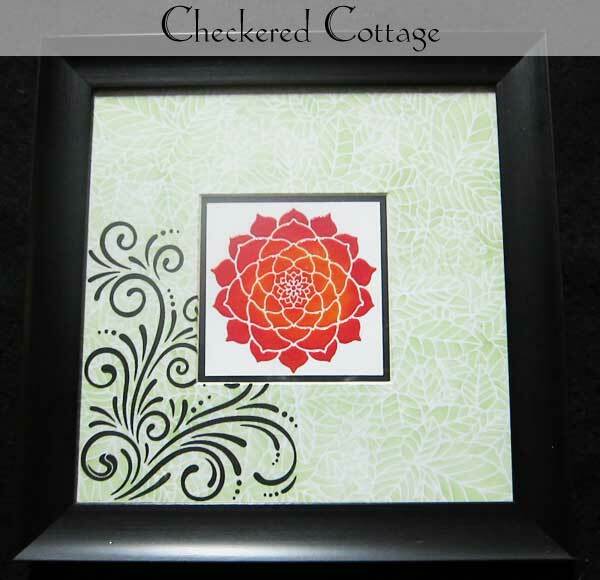 Checkered Cottage has the largest selection of Dreamweaver stencils in the St. Louis area. We welcome you to visit the shop this Friday and Saturday (October 19-20th) for a special trunk show featuring these wonderful products. Guest teacher Louise Healy will be showing students how to create incredible effects with paste, distress powders, alcohol inks, and stencils. The shop will be open extended hours on Friday, October 19th from 10am- 9pm. You won't want to miss this exciting opportunity! Thanks, Kathi! 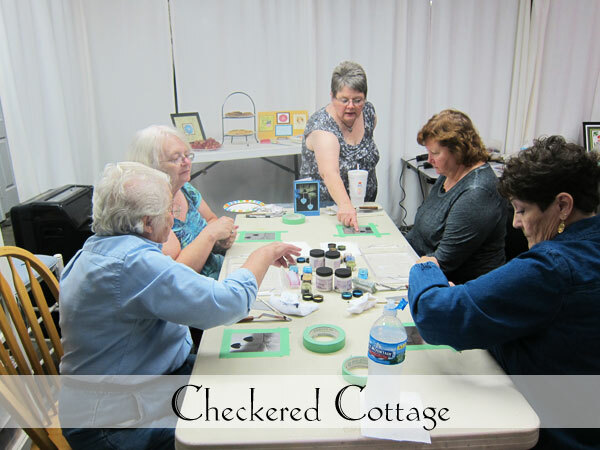 We are happy to have you as part of the Checkered Cottage Team! It's not too early to think about Christmas! Christmas has come early to The Cottage this year! We hosted 3 fantastic classes the first week in October- all designed to spark your creative genius. On Monday, October 1st, Kathi Anderson taught participants how to create 2 beautiful cards using stamps from Impression Obsession. 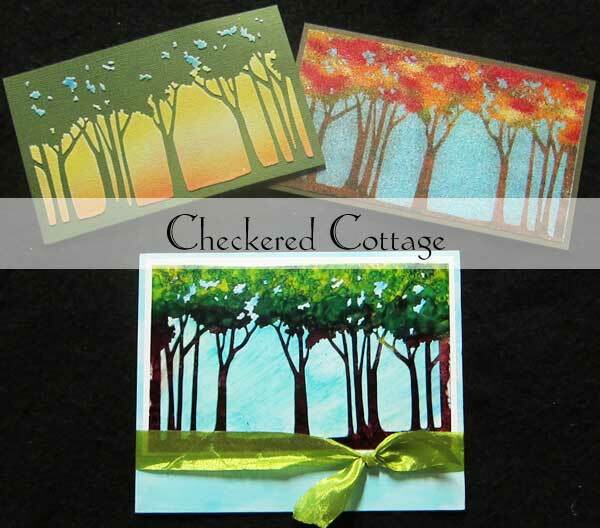 Isn't it amazing how layering card stock adds to these simple and elegant designs? We love the soft shades of green on the "Believe" card- it almost creates an ethereal effect! 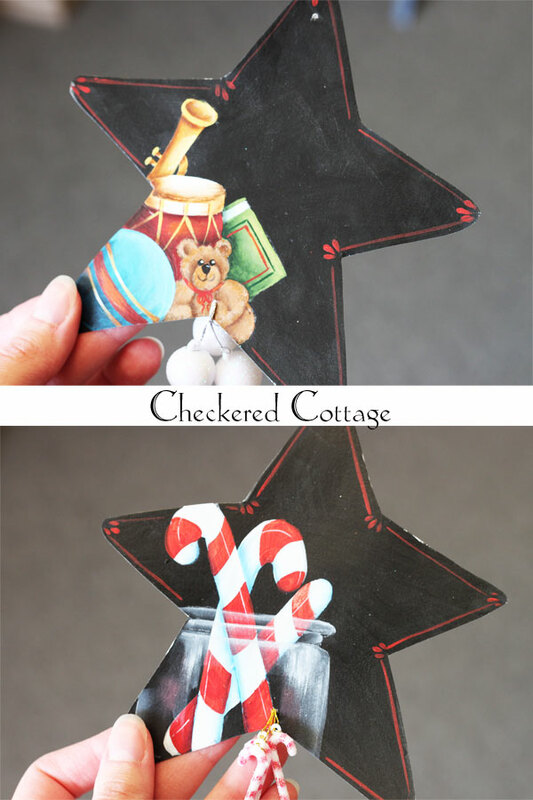 Wouldn't these be great on your tree or displayed on a mantle? And, finally, on Saturday, Jan led participants in an all day Christmas card-making extravaganza. Students completed 8 cards (yes, 8!) 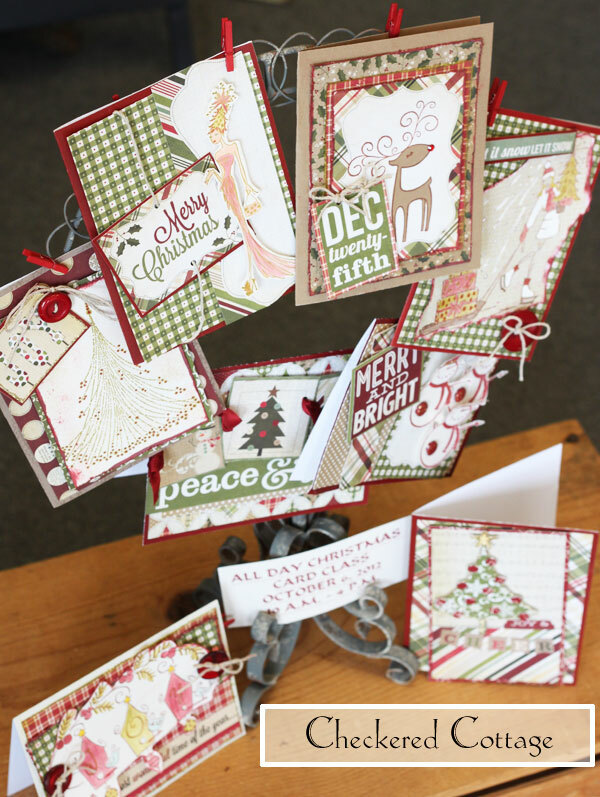 using cheerful paper, stamps from Penny Black and Hero Arts, and fun embellishments. ... and 18 days until our Christmas Open House! 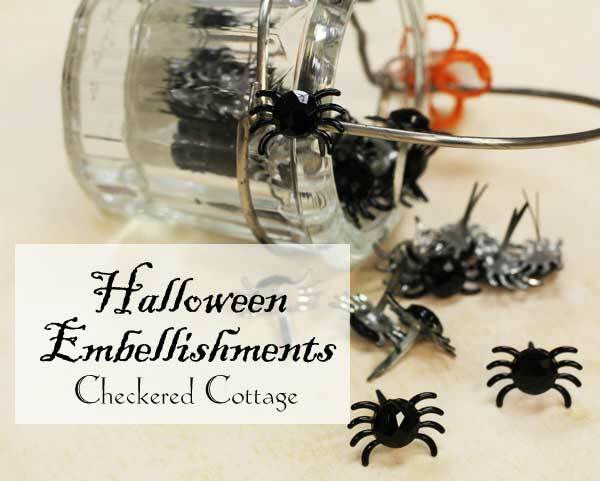 Have you seen these adorable Halloween spider embellishments at the shop? 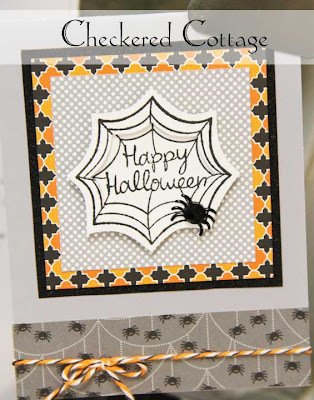 These cute little spiders are actually brads, making them very easy to adhere to your next card or scrapbooking layout. We love how Linda used one of these embellishments to add interest and texture to her Halloween card. Happy Haunting from Checkered Cottage! 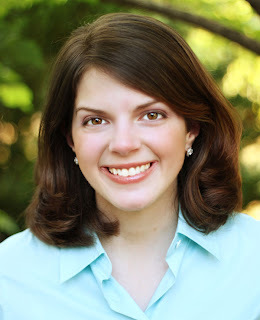 Candice is married to her college sweetheart and is a mama to 2 adorable Shih-Tzu puppies. 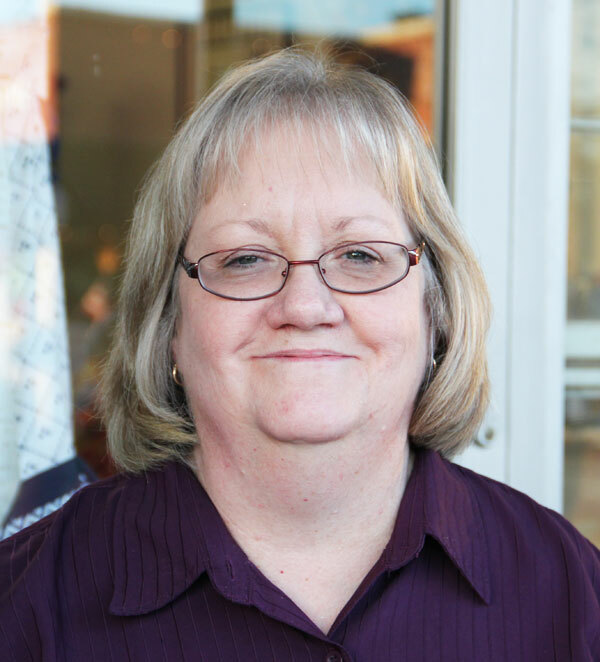 She has a passion for making homemade cards, discovering new recipes, and savoring travel adventures. Candice and her husband are looking forward to welcoming a sweet baby girl next February to the family! I am constantly inspired by beauty in nature. The Botanical Gardens are probably my favorite spot in the city and we try to go there a couple of times per season. What are some of your "go-to" supplies while crafting? I seem to use the following products on many projects: Zig 2-way glue pen, Scotch ATG tape runner, Cutterpede paper cutter, x-acto knife, Krylon gold leafing pen, Quickie glue pen, and Bo Bunny dot papers. I love to edge my cards in either a Krylon gold leafing pen or glitter. While this technique can be a bit tricky to manage at first (and sometimes temperamental! ), it adds so much interest to your finished product. Classic, fun, and sometimes with a vintage twist. In my world, there aren't mistakes- just additional opportunities to create! My mom has been an avid crafter and stamper for as long as I can remember, which means that she passed along the desire to create to me! I remember putting together a entry for a Valentine's stamping contest for a local stamp store while in elementary school. I would go back to Turks and Caicos in a heartbeat. My husband and I spent our honeymoon in this gorgeous location 3 years ago. Since I've been pregnant, I've switched from drinking Diet Coke to either water or fruit juices. My favorite drink right now: Izzie's Sparkling Peach Juice. I've also been craving cheesecake for the past couple of months. Anything by Il Divo, Mumford & Sons, or Adele. Yes! Check out my inspiration boards by clicking HERE. I had the honor of joining The Dating Divas team this past July. This site is dedicated to strengthening marriages by sharing creative dates, as well as quick and easy ideas to show your spouse love. You can check out my recent posts by clicking HERE. My husband and I recently hosted a gender reveal party for our close friends and family. Now that we know our sweet little one is a Baby Girl, I am excited to start decorating the nursery! 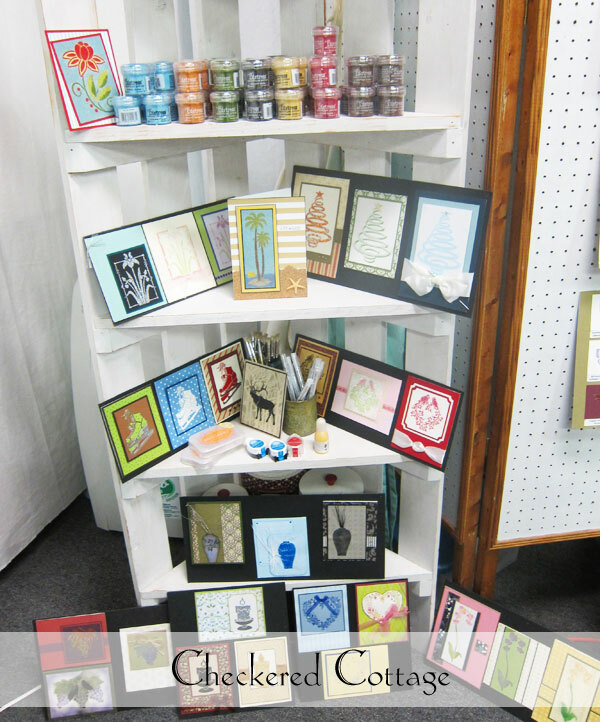 Their cute tag line that they are "The Cheers Bar of the Crafting World" is actually true! It is wonderful to work with such a friendly group of crafters that offer quality products. 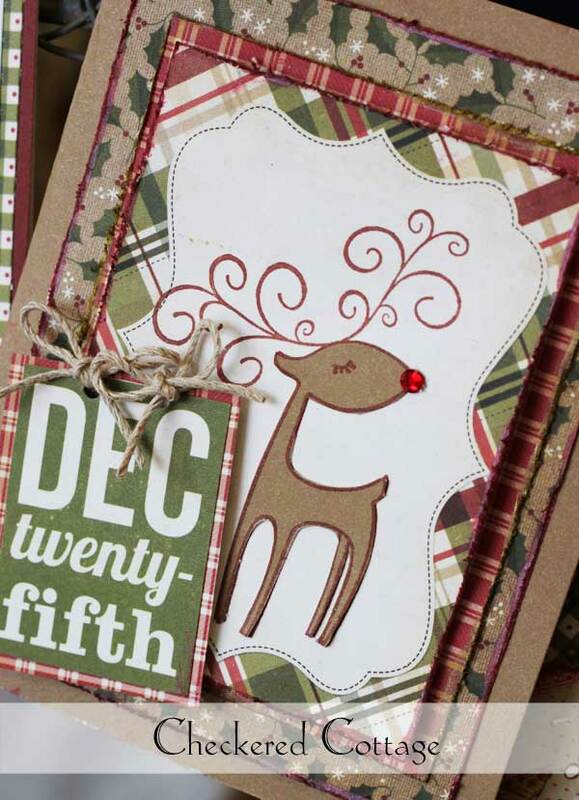 I also adore their selection of Bo Bunny Dot papers. They have the most extensive selection I have seen in the city. Thanks, Candice! 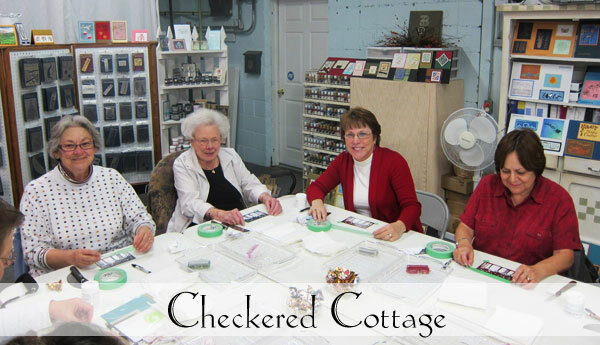 We are happy to have you as part of the Checkered Cottage Team! Save the Date for Louise Healy! The Cottage has a special guest teacher lined up for October 19th and 20th! We are so excited to welcome Louise Healy, who will be teaching several exciting classes. Our classroom area will also be stocked with an incredible array of Dreamweaver products available for purchase. There's still time to sign up for Louise's In the Forest Class offered on both Friday and Saturday. 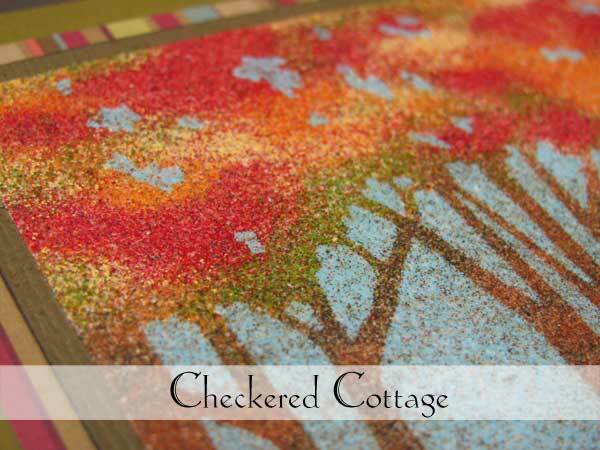 Participants will practice working with distress powders, acetate, and alcohol inks. Check out this detail image of one card- sign up today to learn how to achieve this textured sandpaper effect on your next project! At 3:00pm on Saturday, Louise will be showing students how to make a beautiful framed flower picture using 3 templates and translucent paste. This homemade masterpiece would be the perfect Christmas present for a special person on your list. For more information or to sign-up for these classes, please call the shop at 314-909-7233. Even if you aren't able to take a class, we hope you'll be able to stop by the shop to see all the Dreamweaver products that will be for sale. The shop will be open extended hours on Friday, October 19th from 10am- 9pm. We hope to see you there!